Think of a caster as a tool, a mobility tool. Using the correct casters and wheels is just as important to production as most any piece of equipment in your business. Office chairs that don't roll properly can slow office production. Hand trucks, dollies, and carts with worn out wheels or the wrong caster can slow deliveries and warehouse factory production. The correct wheel is important. The size of wheel is critical to the mobility. Quality bearings in wheels are necessary to extend the life of a wheel, and most inexpensive wheels either do not have a bearing or have a plastic bearing. Casters from big box stores and some internet casters are usually not industrial class casters, even though they look the same. We specialize in industrial casters only. Industrial casters are manufactured with heat treated ball bearings and raceways. This is critical for a caster to swivel under heavy loads. 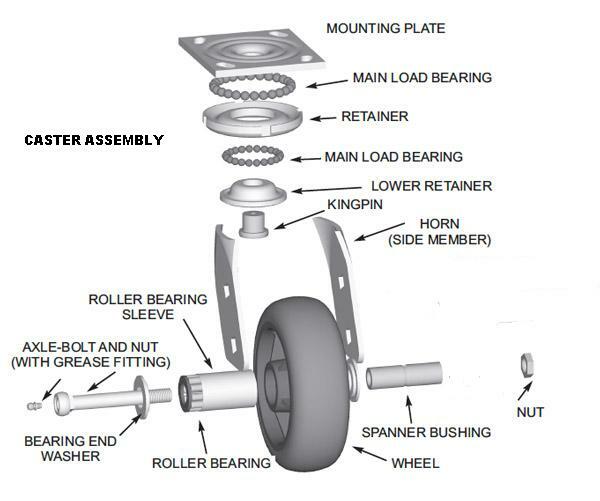 Load carrying capacity of a caster varies by caster and wheel used. On a cart or work bench that weights 500lb plus a load of 500lbs total weight is 1000lbs, caster used in this application should carry at least 250lbs each. The mobility of the piece is determined by the size of the wheel and proper bearings in the wheel and hardened raceways/ball bearings in the swivel caster fork. Different types of wheels are available. Wheels will roll smoothly if used in the correct application. Some wheels are manufactured for floor protection, ease of movement, and quiet rolling. Hard wheels are the easiest to roll, and designed for heavy loads. Non-marking wheels leave floors clean. Soft wheels are quite, however they will flatten in the wrong application when loads are to heavy, and the wheel tread will peel apart on rough surfaces. Help keep your business production up by purchasing the correct caster with the right wheel for the job. We hope the above information is helpful. Please call, email or fax. We are here to help you select the right caster mobility tool and save you money, time, and effort.